Macau SAR PR China — Celebrating the 61st Anniversary of the People’s Republic of China, Grand Lisboa Macau presents “Capture Your Memories” Photo Contest during 20th September to 18th October, 2010. It welcomes entrants from any country to submit photos with any Grand Lisboa Macau elements. 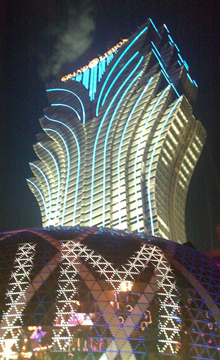 As an icon of Macau , Grand Lisboa is always the popular place visited by both locals and tourists. Its exterior and interior are also considered as the most favorite photo-shooting venue by visitors and photographers, such as the design of the building which resembles a Golden Lotus in full bloom, the luxurious interior decoration, the valuable art pieces and different restaurants offering an eclectic mix of local and international cuisine. Photos taken at Grand Lisboa Macau become the pieces of precious memories. We look forward to sharing these photos with the entrants. “Capture Your Memories” Photo Contest includes the following five categories: “Best Love China Photo”, “Best Grand Lisboa Building Photo”, “Best Camera Angle Photo”, “Best Emotional Photo” and “Best Creative Photo”. Each of the winners will receive MOP10,000 cash prize and Grand Lisboa Macau hotel accommodation and dining coupon valued at MOP5,000. In addition, there will also be 10 Awards of Merits and each winner will receive MOP2,000 cash prize. The judging panel includes Dr. Ambrose So, Director of SJM, Ms. Angela Leong, Director of SJM, Mr. Louis Ng, Director and Chief Operating Officer of SJM and Representative of the Photographic Society of Macao. Share your photos with us and win the attractive prizes. For detailed information, please refer to our promotional flyers or visit Grand Lisboa website (www.grandlisboa.com). Grand Lisboa offers over 310 gaming tables where guests can enjoy a variety of games including Baccarat, Caribbean Stud Poker, Sic Bo, Texas Hold’em Poker, Craps, Casino War, Blackjack, 3 Card Baccarat, Roulette, Fortune Wheel and a traditional Chinese game, Pai Gow. The venue also accommodates more than 700 slot machines located throughout the casino. The famous Crazy Paris Show and Tokyo Nights provide performances in Grand Lisboa everyday. There are 430 ultra-luxurious rooms and suites, state-of-the-art meeting facilities and banqueting facilities, a fitness centre, swimming pool, spa and outstanding food and beverage facilities with Michelin-stars awards in Grand Lisboa as well.